Francis Xavier was born in the castle of Xavier in Navarre, Spain. After his schooling at home, he joined the University of Paris and obtained a Master’s Degree. He was looking forward to a brilliant career at the university, when providentially, Ignatius of Loyola, a fellow-student, made his acquaintance and Xavier joined the small, select band of companions of Ignatius, later to be known as Jesuits. Ignatius inspired and guided Xavier to reach out to nobler ideals and more challenging goals. Once the compelling call of Jesus to spread the good news of the kingdom and to win souls for Christ was made clear to Xavier, there was no turning back, no stopping him. 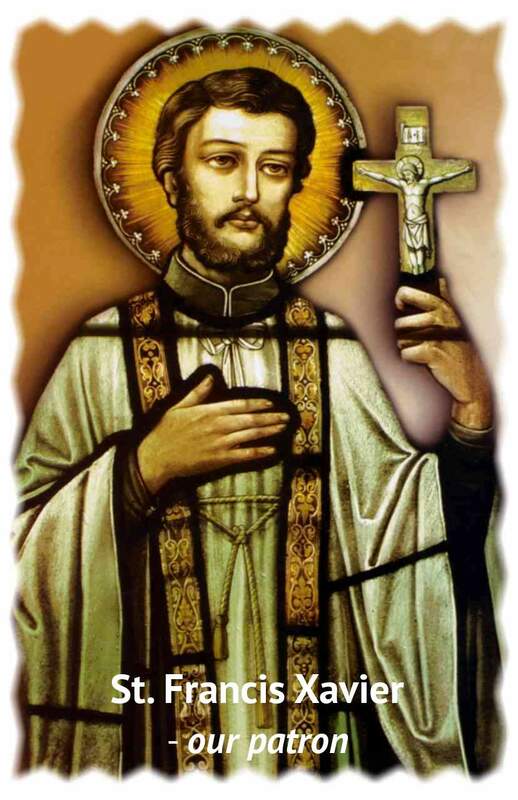 When King John of Portugal and Pope Paul III desired to send missionaries to the East, and the man Ignatius selected was unable to go because of illness, Francis Xavier, the second choice, became the man of destiny. Given only a day’s notice, he left for Lisbon and set sail for India, reaching Goa on the 6th of May 1542. Like a blazing meteor, Xavier traveled across the eastern mission fields from Goa along the Malabar Coast to Tuticorin and the Coromandel, crossing the sea of Malacca and Singapore on the Malaysian peninsula, then on the Spice Islands and finally reaching Japan from the Macao base. In ten short years, despite the interminable delays of sea travel, he made three trips to the East, doting the coastline of India and the eastern lands with flourishing Christian communities, that stand out even today, more than four centuries later, as a striking testimony to the faith, the zeal and the untiring labors of the man on a mission, this saint in a hurry, Francis Xavier. His last journey to enter the impenetrable Chinese mainland found him on the threshold of China, his eyes fixed on the mainland, where his heart already was, but his body lay worn-out and dying on the island of Sancian. St. Xavier’s College, founded in 1964 by the Kerala Province of the Society of Jesus and located on the very path sanctified by the missionary travels of St. Francis Xavier, is a fitting memorial to the saint who gave faith to the forefathers of our coastal Christians.